Expectations were high and should be when two iconic singers hit the same stage on the same night. 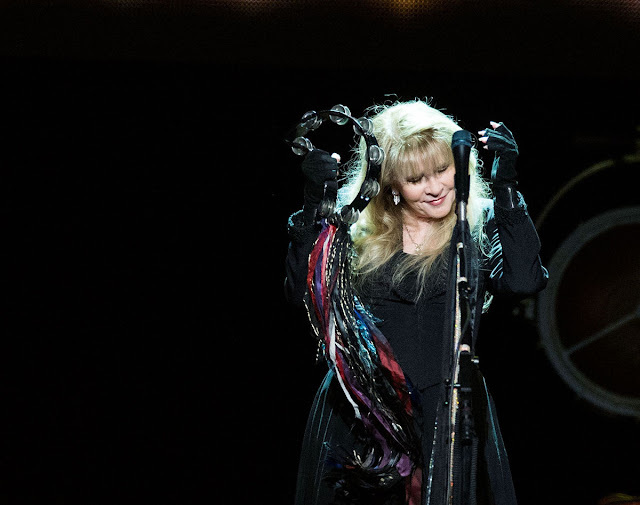 Stevie Nicks and Chrissie Hynde, leading Pretenders, know where that bar is and each hit it Wednesday night at the nearly sold out Smoothie King Center. 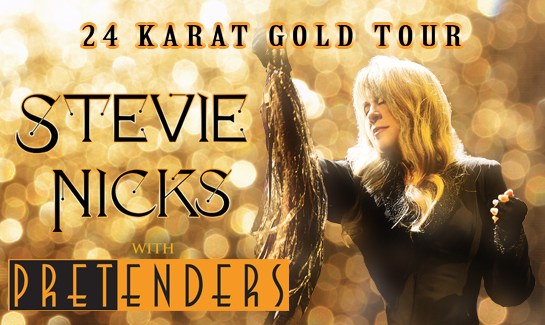 The Gold Dust Woman took her adoring fans on a trip through her entire catalog. Stevie dug deep to her beginnings in Buckingham Nicks to Fleetwood Mac and on through her more than three-decade solo career. Nicks pulled out classics and reached into what she calls her “gothic box of lost songs” to deliver a deeply personal show. Nicks is quite the storyteller and dropped golden nuggets of her musical history. “It’s a journey, it’s a trip, come with me,” Nicks encouraged the crowd. While she opened with Gold and Braid, a track she recorded but didn’t use on her enormous solo debut Bella Donna, Nicks quickly dished out some fan favorites. If Anyone Falls from her 1983 “Wild Heart” album followed before she described what it was like to cut a solo album as Fleetwood Mac became the biggest band in the world in the late 70‘s. Her producer and then boyfriend Jimmy Iovine brought her a song from Petty and it catapulted Nicks solo career. “Stop Dragging My Heart Around” fired up the crowd and when Chrissie Hynde stepped in to fill Petty’s vocals on the duet, it was a special moment to watch the Rock and Roll Hall of Famers perform together. The fifth song of the night was finally a Nicks-penned Mac hit, “Gypsy” from their “Mirage” album. Fans jumped up and danced like it was 1982 while Nicks did her signature spin. Determined to make sure no one would say her solo career was a fluke Nicks said she wrote a lot of songs while touring with Fleetwood Mac for “Mirage.” When the tour ended, she went back into the studio to cut “The Wild Heart,” which became her second multi-million selling solo smash. “I was not going to be a one-hit wonder,” she said. Then Nicks dove into the story of her next song as she sat in her living room in 2005 drawing while the news on the TV kept going back and forth to the massive hurricane bearing down on New Orleans. She said as a writer “you’re like a news reporter,” and began writing a poem about what she saw happening here. “I’m going to write a story about someone who lives in the city and loves the city. People will survive, they will rise to the occasion because they are a great city.” The result is the heartfelt New Orleans from her 2011 album In Your Dreams. It was a moving tribute to the city. All night Nicks proved her sing and songwriting chops take second place to no one and while up to this point she only performed one Mac hit, she would finish the night with a Fleetwood flourish. Nicks rolled out a powerful version of “Gold Dust Woman” from the all world hit “Rumours” as the band found one of its many highlights of the night. After a much too long band introduction, she closed out the set with “Edge of Seventeen” while more of a tribute to Prince played out on the screen. The enthusiastic crowd wouldn’t leave until they got a little more and Nicks delivered with “Rhiannon” as longtime friend, guitarist and musical director Waddy Wachtel led the way. A Nicks concert though could never end without one more song, one she wrote in Aspen, Colorado in 1973. With Wachtel on acoustic by her side, Nicks was nearly pitch perfect on her signature song. It’s a simple song that tends to fill her fans with great emotion, bringing some to tears like the sweet woman sitting two seats away. She wiped her eyes as Stevie said good night and a good night it was. 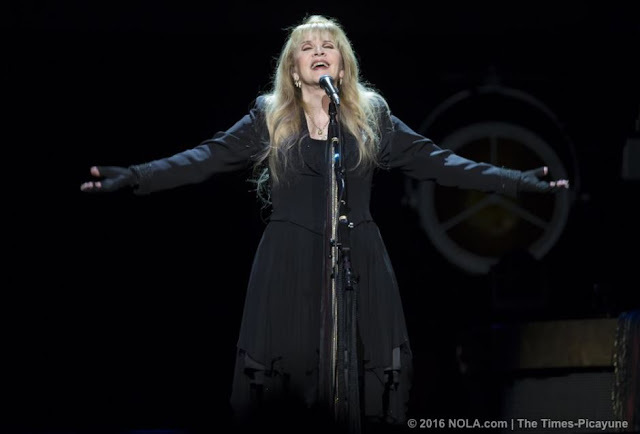 The focus of Stevie Nicks’ current solo tour, she explained Wednesday at a nearly full Smoothie King Center, is “songs that I love to sing, not that I have to sing.” With that intention, she did herself, and her fans, a favor. Most of them deserved to be let out, especially by her full-bodied band led by Waddy Wachtel, the go-to session guitarist for the likes of James Taylor, Jackson Browne, Linda Ronstadt, Keith Richards, Warren Zevon, and, in the early 1970s, a then-unknown duo called Buckingham Nicks. Nicks may well have been the beautiful, doe-eyed hippie-witch that every '70s male rock star wanted to date, but she was also relentlessly ambitious, determined to build a solo career independent of Fleetwood Mac. She wrote songs while on tour with the band; when her Mac-mates went on vacation, she went into a recording studio. That album’s lead single was the Petty duet “Stop Draggin’ My Heart Around,” which he wrote with his guitarist, Mike Campbell. On Wednesday, Chrissie Hynde returned to the stage following her thrilling opening set with the Pretenders to share “Stop Draggin’ My Heart Around” with Nicks. Their connection and mutual respect felt genuine. While making the follow-up to “Bella Donna,” Nicks was “more famous, a little more spoiled, not as focused.” Still, she was determined not to be a one-hit-wonder. The success of “The Wild Heart” confirmed she wasn't. She recounted how that album’s hit “Stand Back” is based on the melody of Prince’s “Little Red Corvette”; he came to the studio to approve her innovation and play on it. Rock and roll legend Stevie Nicks touched the hearts of many audience members Wednesday night at her New Orleans performance. This performance was particularly special when Nicks told the backstory of her song “New Orleans.” She wrote the song during the aftermath of Hurricane Katrina. She said the hurricane had a “huge effect” on her and she found herself trapped in front of the TV screen, staying up to date on every aspect of the Katrina story. It devastated her that an entire city and everyone who lived there had to go through the hardships of a natural disaster, especially an atrocity like Katrina. She said she knew she had to write about it, but didn’t want it to just tell a tragic story; she wanted to inspire. She wanted to express that the city would make it through tough times. It was clear that the crowd was thankful and emotional toward Nicks’ heartwarming performance of “New Orleans.” People were standing and cheering more than they had for any other song. Aside from the moving “New Orleans” performance, she put on an all-around beautiful show. Her sets were different from others on past tours. She featured images of her artwork on the backdrop and shined bright, vibrant colors into the crowd and onto the stage. Her unique voice was untouched by the effects of aging and as always, she had her iconic blue shawl and classic twirl. She twirls to the beat of the melody as if the music takes her over. Audience members joined in with her, twirling their arms and dancing to the beat. “Stand Back” was written after she heard a Prince song on the radio. She spent hours writing lyrics to the sound of his music. She joked on stage about how strange and nerve-wracking it was when she called Prince out of the blue. She told him about the song and he came over within the hour. He was laid-back the entire time, and when she asked him if he wanted to record the piano and guitar part of the song, he managed it in under an hour. She wrote “Landslide” in Aspen, Colorado, in 1973. It was there that she was visiting with Lindsey Buckingham, with whom she collaborated on her first ever album, “Buckingham Nicks.” She went out on the balcony, looked out at the snowy hilltops and wrote music. The words and meaning of the song came to her easily. However, it wasn’t released until two years later, on the Fleetwood Mac album. Nicks’ 24 Karat Gold tour was completely different from anything she had ever done by being personal and wonderfully unique. I wouldn’t be surprised if I was the only person under 55 on the Gulf Coast who doesn’t get overly excited about live music or going to a concert. Sure, I don’t mind going to a concert or two if I love the artist, but you won’t catch my diva self trekking through mud at a festival or standing in the sun all day to get stomped on by drunk people and smell patchouli and nachos while waiting for the headliner who is 45 minutes late. My boyfriend, Alec, loves Stevie Nicks and Fleetwood Mac. Like, he really loves them. Me? I love singing “Landslide” in my car and recently learned the words to “Rhiannon” because Alec plays it about once or seven times a day.